Black Man Beaten At Charlottesville White Nationalist Rally Is Acquitted Of Assault : The Two-Way Images of DeAndre Harris, 20, being pummeled by white men with poles surfaced after the rally last August. Harris was later charged with assault himself — and, on Friday, found not guilty. DeAndre Harris, seen balled on the ground, suffers a beating in a parking garage near the Charlottesville police station after the white nationalist rally last August. DeAndre Harris, a black man brutally beaten after a white nationalist rally last August in Charlottesville, Va., has been found not guilty of misdemeanor assault for his role in the incident. The city's General District Court handed down the ruling Friday. Harold Crews, 48, an attorney and chairman of the North Carolina League of the South, had pressed charges against Harris on Oct. 12 — two months to the day after hundreds of white nationalists across the U.S. descended on Charlottesville for the Unite the Right rally. Deadly violence followed that demonstration, including the beating Harris sustained at the hands of several white men, which was caught on camera and later went viral. Harris, 20, suffered serious injuries during the attack, saying later that because of the beating, he had "eight staples in my head, a broken wrist and a chipped tooth." But Crews argued that it was he who had been unlawfully wounded by Harris. The original charge, a felony punishable by up to five years in prison, was later amended to misdemeanor assault and battery. "In one piece of YouTube footage, Crews is clasping a large flagpole in front of a black protester, who is tugging on the other end. As the two of them tussle over the pole, Harris swings a flashlight at Crews, appearing to strike him on the head or shoulder. "Moments later, several white nationalists — one of them dressed in military tactical gear and holding a plastic shield — storm into the garage, chasing Harris and forcing him to the ground, where he was brutally pummeled." Harris maintained that he had been swinging at Crews' flagpole, and ultimately, it was this argument Judge Robert Downer sided with, ruling that the prosecution failed to prove that Harris intended harm to Crews. 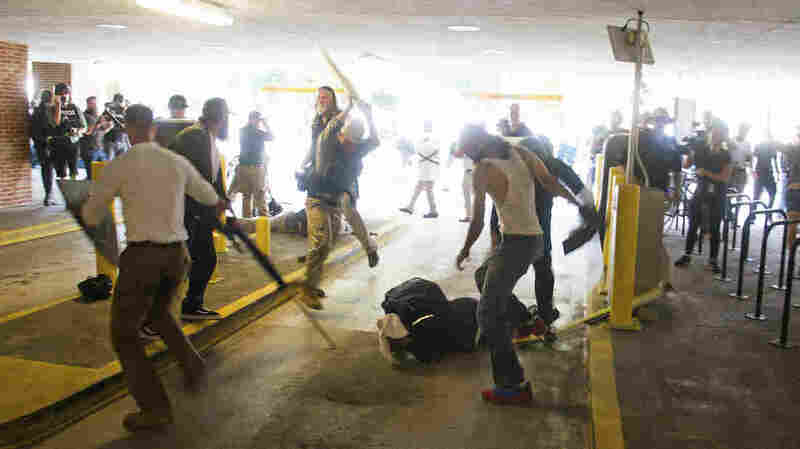 As for the crowd that stormed Harris immediately after that confrontation, beating him to the ground with poles in a parking garage, four men have been charged with felony assault or malicious wounding: Daniel Patrick Borden of Ohio, Jacob Scott Goodwin of Arkansas, Alex Michael Ramos of Georgia, and Tyler Watkins Davis of Florida. None of the men has had his trial yet. Demonstrators gathered outside the courthouse in Charlottesville on Friday, showing their support for Harris. "What do we want? Justice! When do we want it? Now!" the protesters shouted. "If we can't get it, shut it down." These cases represent just a fraction of the rally's legal fallout. An independent review published in December found fault with Charlottesville police and other city authorities, as NPR's Laurel Wamsley reported. The violence revealed "a failure of one of government's core functions — the protection of fundamental rights," the report asserted. "Law enforcement also failed to maintain order and protect citizens from harm, injury, and death." And one of those fundamental rights, free speech, is the subject of a lawsuit filed recently against the organizers of the rally. "We want to send a message that you can't do this," attorney Roberta Kaplan, who is representing the plaintiffs, told NPR's Rachel Martin on Friday. "People are entitled to have their First Amendment beliefs in this country and to speak those beliefs," Kaplan continued, "but what they're not allowed to do in this country is to plan, commit and then celebrate violence motivated by those beliefs."